Tag Archive | "Guinean Bichir (Polypterus ansorgii)"
The Guinean bichir (Polypterus ansorgii)is native to West Africa (Guinea). It is believed to be found from the Ogun River in Nigeria to the Corbal River in Guinea Bissau, in Lake Kainji and in the Niger river basin near Kouroussa in Guinea however, its wider distribution is unconfirmed. The Guinean Bichir is considered rare by tropical fish keeping enthusiasts because it is not generally exported for the aquarium trade. It is easily confused with other species which could explain the wide deviation of their reported maximum size. 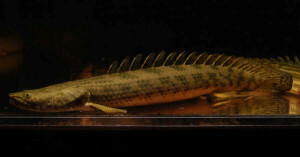 The Guinean Bichir was originally believed to attain a maximum length of 11″ however it is now believed that wild specimens may grow to 36″ in length. All Bichirs are relatively peaceful with fish that are too large for them to consume, but given the chance, they will eat smaller fish and even others of their own kind. Bichir tank mates should be close to the same size when housing more than one fish in a tank. The Guinean Bichir needs a substrate of sand or fine gravel in an aquarium densely planted with potted or well rooted and overhanging plants, Java Fern , and Java Moss to give them respite from bright lights. Being nocturnal, they need places to hide and do well in aquariums with lots of rockwork and plenty of bogwood and driftwood . Guinean Bichirs love meaty live foods such as blood worms, black worms, small crustaceans, and earthworms. They will also eat a variety of frozen foods such as brine shrimp, mysis shrimp and beef heart. Although dried foods are usually rejected, they will gradually accept a quality carnivore pellet, stick, or tablet. Guinean Bichirs are sloppy eaters. They need good filtration and frequent partial water changes to maintain water quality and keep them healthy. Although they are bottom dwellers, they still need to surface periodically to breathe air. Make sure their tank is tightly covered and that there is sufficient space for them to gulp air when needed. To date there are no confirmed breeding s of Guinean Bichirs.